Your Las Vegas Event just got better! "Over 20 years Entertaining Top Companies!" Large Groups on Stage or Small Cocktail parties. Your Vegas Event will be talked about for years. Our magicians know how to entertain! Corporate Meeting, Trade Show, or Cocktail Party. Close-up illusions right in your own hands or enjoy the full stage show... Let's have some fun! For an unforgettable experience - Contact Us now! A professional entertainer for over 20 years, from the Magic Castle in Hollywood to National TV. 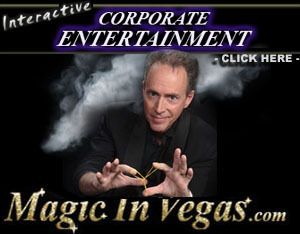 Patrick is your "go-to" Corporate Vegas Magician! Pump up the energy level at YOUR next Event. "A Class Act with a Twist of Interactive Fun! without a seasoned professional entertainer." ...or call us "In Vegas" at (702) 544-8183 . Las Vegas Wedding or Special Event! 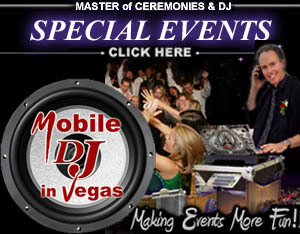 The right Las Vegas Mobile DJ can guarantee the success of your Las Vegas Wedding or Party. Our Las Vegas Mobile DJ will take care of everything... With over 20 years experience! Meet with your Las Vegas Wedding DJ to pre-plan your Big Day or Private party in Las Vegas. Your personal Las Vegas DJ works WITH you to select the right music - No surprises...Just fun! Need the perfect Las Vegas Wedding DJ? DJ for a Company Party? Family Reunion DJ? We will keep the dance floor dancing! Start the party - your Las Vegas DJ has arrived! Our Las Vegas Mobile DJ customizes the evening with all the music that YOU want to hear. Over 20 years in the entertainment industry. of audience participation and non-stop energy, making for a unique blend of fun entertainment on the dance floor for all to enjoy! A Las Vegas Wedding DJ for that special day? from Sock Hop to Hip Hop! Are there songs you like? ..Music you don't like? No problem... It's YOUR party! Tell us what you want - Your Mobile DJ plays it! and will always show up dressed appropriately. Our Las Vegas Mobile DJs are always on time. Remember... We're there to make YOU look good. Our DJs work hard for YOU to make YOUR event in Las Vegas a success to remember! Las Vegas Magician or Las Vegas Mobile DJ... We'll make your next Las Vegas event a memorable one!